ITIL is a public(operational) framework that describes Best Practice in IT service management.It provides a framework for the governance of IT, the ‘service wrap‘, and focuses on the continual measurement and improvement of the quality of IT service delivered, from both a business and a customer perspective. This focus is a major factor in ITIL‘s worldwide success and has contributed to its prolific usage and to the key benefits obtained by those organizations deploying the techniques and processes throughout their organizations. ITIL was published between 1989 and 1995 by Her Majesty‘s Stationery Office (HMSO) in the UK on behalf of the Central Communications andTelecommunications Agency (CCTA).Its early use was principally confined to the UK and Netherlands. A second version of ITIL was published as a set of revised books between 2000 and 2004. The initial version of ITIL consisted of a library of 31 associated books covering all aspects of IT service provision. This initial version was then revised and replaced by seven, more closely connected and consistent books (ITIL V2) consolidated within an overall framework. This second version became universally accepted and is now used in many countries by thousands of organizations as the basis for effective IT service provision. In 2007, ITIL V2 was superseded by an enhanced and consolidated third version of ITIL, consisting of five core books covering the service lifecycle. 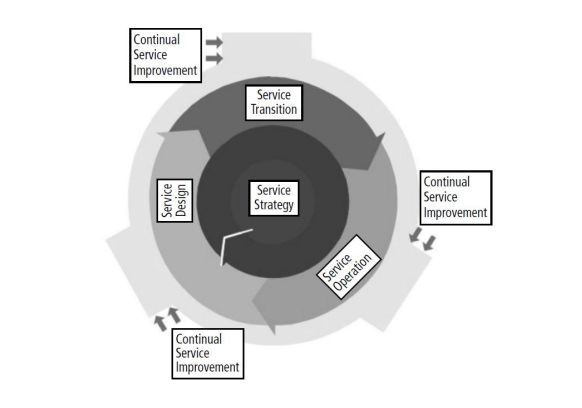 The five core books cover each stage of the ITIL Service Lifecycle from the initial definition and analysis of business requirements in Service Strategy and Service Design, through migration into the live environment within Service Transition, to live operation and improvement in Service Operation and Continual Service Improvement. 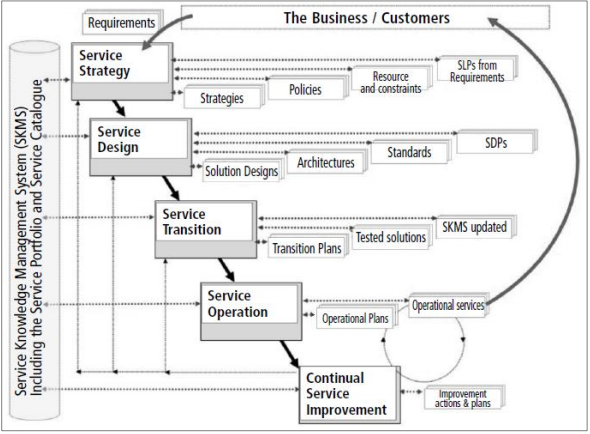 The diagram illustrates how the service lifecycle is initiated from a change in requirements in the business. These requirements are identified and agreed within the Service Strategy stage within a Service Level Package (SLP) and a defined set of business outcomes. This passes to the Service Design stage where a service solution is produced together with a Service Design Package (SDP) containing everything necessary to take this service through the remaining stages of the lifecycle. ITIL V3 is best understood as seeking to implement feedback-loops by arranging processes in a circular way. Also, that the old structure of Version 2 was replaced, but most processes and function are still available in V3. 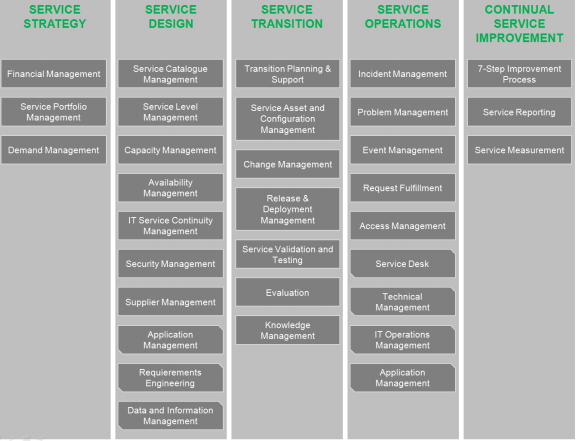 The core processes of IT service management are described within two ITIL documents: Service Support and Service Delivery. ITIL (IT Infrastructure Library) is the most widely accepted set of best practices in the IT service delivery domain and is complementary to COBIT. 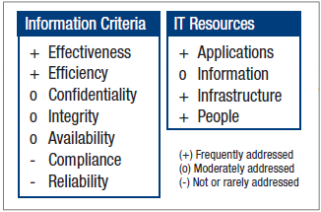 Control Objectives for Information and Related Technology (CobiT) is the most holistic, internationally recognized framework aimed at achieving organizational information technology goals and objectives, developed and maintained since 1996 by IT Governance Institute – an organization tightly cooperating with Information Systems Audit and Control Association (ISACA). Being a model of IT governance and information systems audit and control, CobiT is designed to provide effectiveness and efficiency while mitigating the risks connected with the use of IT based solutions. 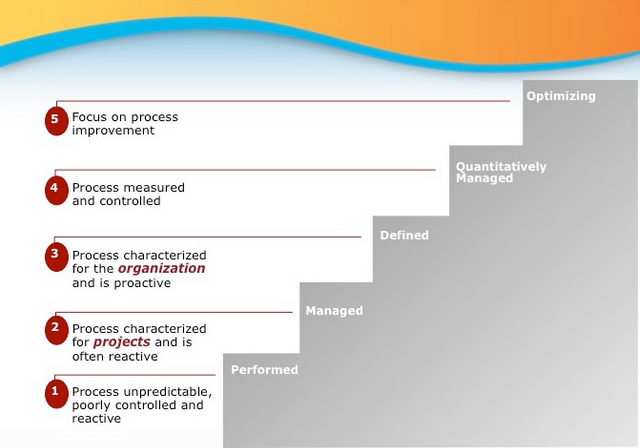 The framework is fully process-oriented and measurement driven. Its structure provides a definition and measurement tools for assessing IT related organizational control objectives. CobiT evolved as a set of good practices, which confirms its business applicability. The PO domain includes 10 processes responsible for the definition, realization and communicating of IT strategy across the organization. These processes are the following: PO1 Define a Strategic IT Plan, PO2 Define the Information Architecture, PO3 Determine Technological Direction, PO4 Define the IT Processes, Organisation and Relationships, PO5 Manage the IT Investment, PO6 Communicate Management Aims and Direction, PO7 Manage IT Human Resources, PO8 Manage Quality, PO9 Assess and Manage IT Risks,PO10 Manage Projects. All domain groups 7 processes aimed at implementing and procuring the necessary means and resources for implementing IT strategy. AI domain includes the following processes: AI1 Identify Automated Solutions, AI2 Acquire and Maintain Application Software, AI3 Acquire and Maintain Technology Infrastructure, AI4 Enable Operation and Use, AI5 Procure IT Resources, AI6 Manage Changes, AI7 Install and Accredit Solutions and Changes. The main goal of the DS domain is to deliver defined IT services and is made up of the following 13 processes: DS1 Define and Manage Service Levels, DS2 Manage Third-party Services, DS3 Manage Performance and Capacity, DS4 Ensure Continuous Service, DS5 Ensure Systems Security, DS6 Identify and Allocate Costs, DS7 Educate and Train Users, DS8 Manage Service Desk and Incidents, DS9 Manage the Configuration, DS10 Manage Problems, DS11 Manage Data, DS12 Manage the Physical Environment, DS13 Manage Operations. The last ME domain is designed to assess the quality and compliance of all processes with their control requirements over time. It includes the following 4 processes: ME1 Monitor and Evaluate IT Performance, ME2 Monitor and Evaluate Internal Control, ME3 Ensure Compliance With External Requirements and ME4 Provide IT Governance. Management guidelines including listing of other CobiT processes constituting input and output of the process, RACI chart, describing who is responsible/accountable/consulted and/or informed when performing a specific activity and a detailed chart of goals and metrics. – Availability: Relates to information being available when required by the business process now and in the future. It also concerns the safeguarding of necessary resources and associated capabilities. Applications are automated user systems and manual procedures that process the information. Information is the data (in all their forms) input, processed and output by the information systems in whatever form is used by the business. Infrastructure is the technology and facilities (hardware, operating systems, database management systems, networking, multimedia, etc., and the environment that houses and supports them) that enable the processing of the applications. People are the personnel required to plan, organise, acquire, implement, deliver, support, monitor and evaluate the information systems and services. They may be internal, outsourced or contracted as required. 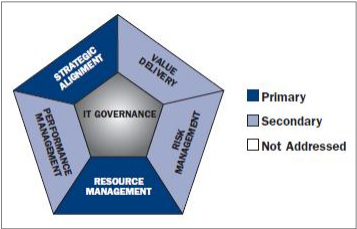 CobiT as the most holistic IT/IS framework concentrates more on “what”to do than on “how” to do it. For this reason it delegates “how-to-do” related issues to other tools, frameworks and methodologies. 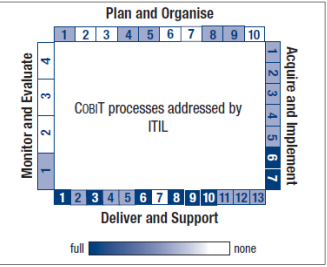 There are various documents within the CobiT library describing the mapping of CobiT concepts and structure to other frameworks and standards. These documents include mapping CobiT to: ITIL, CMMI, TOGAF and others. Below are some main concepts connected with CobiT mapping to other frameworks mentioned in this document: ITIL and CMMI are described. CobiT interlaces with ITIL primarily in DS and AI domains; however processes from other domains are also significant to a certain degree. Also other concepts like information criteria, information resources and IT governance focus are mapped to some extent. CobiT/CMMI mapping is concerned with some concepts pertaining to process improvement for development activities, the implementation, acquisition and maintenance of systems and software products. CobiT also widely utilizes original CMMI concept e.g. maturity models. CMMI maps all processes of the All domain and some processes of remaining domains. Also other concepts like information criteria and information resources are mapped to some extent. 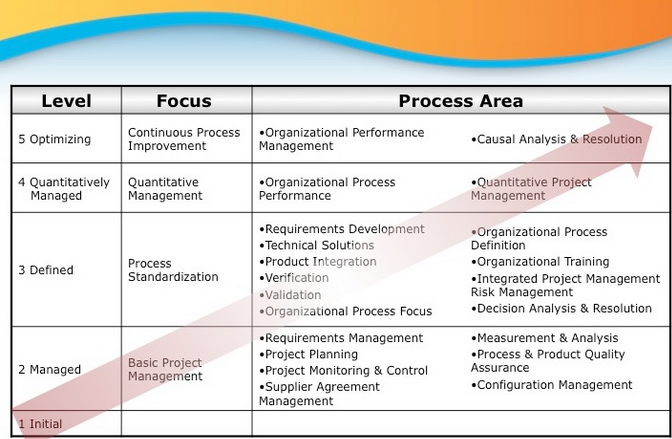 The following pictures describe CobiT/CMMI mapping in a greater detail. Neither ITIL nor CMMI are CobiT alternatives but rather frameworks that help to fulfil CobiT requirements at a lower level. TOGAF(The Open Group Architecture Framework) is an architecture framework. TOGAF provides the methods and tools for assisting in the acceptance, production, use, and maintenance of an enterprise architecture. It is based on an iterative process model supported by best practices and a re-usable set of existing architecture assets. 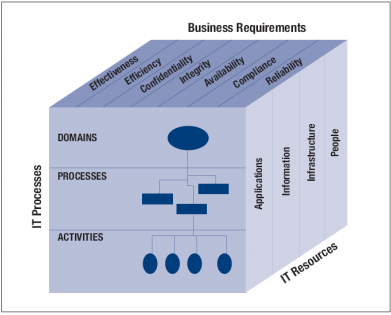 The Business Architecturedefines the business strategy, governance, organization, and key business processes. The Data Architecturedescribes the structure of an organization’s logical and physical data assets and data management resources. The Application Architectureprovides a blueprint for the individual applications to be deployed, their interactions, and their relationships to the core business processes of the organization. The Technology Architecturedescribes the logical software and hardware capabilities that are required to support the deployment of business, data, and application services. This includes IT infrastructure, middleware, networks, communications, processing, standards, etc. With some exceptions, the majority of enterprise architecture frameworks focus on the first of these – the specific set of deliverables – and are relatively silent about the methods to be used to generate them (intentionally so, in some cases). The architecture supports both the business strategy and the business model. The architecture is flexible enough to respond to new market requirements and changes. The architecture guarantees an optimum basis for business intelligence. The complexity of the architecture and therefore of the IT is reduced. The advantages and disadvantages of various architectures are known. The Capability Maturity Model Integration (CMMI) project is a collaborative effort to provide models for achieving product and process improvement. The primary focus of the project is to build tools to support improvement of processes used to develop and sustain systems and products. The output of the CMMI project is a suite of products, which provides an integrated approach across the enterprise for improving processes, while reducing the redundancy, complexity and cost resulting from the use of separate and multiple capability maturity models (CMMs). The CMMI was developed at the Software Engineering Institute at Carnegie Mellon University with representation from defense, industry, government, and academia, and is now operated and maintained by the CMMI Institute, an operating unit of CMU. It is the successor of the popular Software CMM, or SW-CMM. The are multiple “flavors” of the CMMI, called “Constellations,” that include CMMI for Development (CMMI-DEV), CMMI for Services (CMMI-SVC), and CMMI for Acquisition (CMMI-ACQ). The three Constellations share a core set of sixteen Process Areas. There is also a “People CMM,” or P-CMM, that exists outside of the three CMMI Constellations. 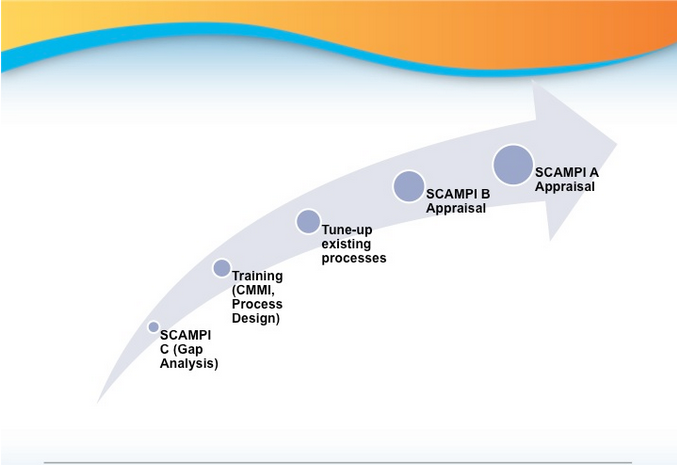 The Standard CMMI Appraisal Method for Process Improvement (SCAMPI) is the appraisal method that is employed by a Certified SCAMPI Lead Appraiser to help your team “achieve a level.” There are three different types of appraisals, called “Classes” and they are SCAMPI A, SCAMPI B, or SCAMPI C. The SCAMPI A is the only appraisal method that results in a Maturity or Capability Level Rating. A SCAMPI C is typically used as a gap analysis and data collection tool, and the SCAMPI B is often employed as a User Acceptance or “test” appraisal. The results of a SCAMPI A Appraisal are published on the CMMI Institute Website known as “PARS” and is available for viewing by the public. Only a Certified SCAMPI Lead Appraiser can conduct a SCAMPI A Appraisal. Within the Process Areas in the CMMI, there are multiple “Specific Goals ” and Specific Practices.” These practices define the expected behaviors of projects and organizations. There are also twelve “Generic Practices ” that provide guidance for organizational excellence including behaviors such as setting expectations, training, measuring quality, monitoring process performance, and evaluating compliance. While every organization is different, it is typical to start your CMMI and performance improvement journey with a gap analysis, or “SCAMPI C” Appraisal. The SCAMPI C will give you a practice-by-practice analysis of the entire scope of CMMI, and a set of observations and recommendations for addressing any weaknesses. This is often followed by “Introduction to CMMI” training, or other training for key individuals, followed by some level of effort to write, modify, align, adopt, or remove process assets. These organizational assets may include process definitions, templates, work instructions, newsletters, reports, training, policies, methods, tools, and more. 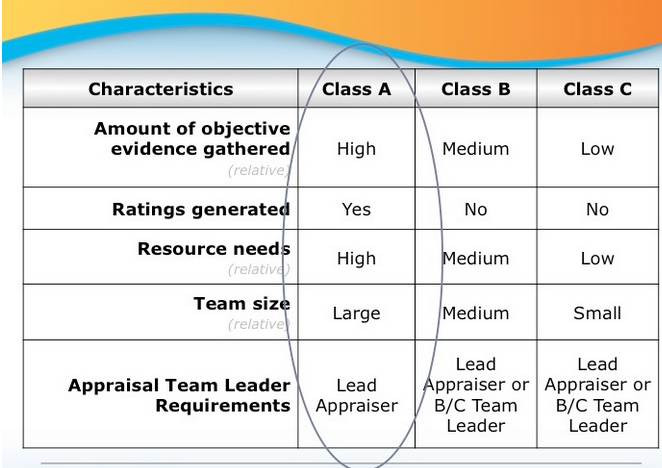 When your team is ready to proceed, one or more formal appraisals are conducted – ultimately culminating in a “SCAMPI A” Appraisal and a successful CMMI Rating!